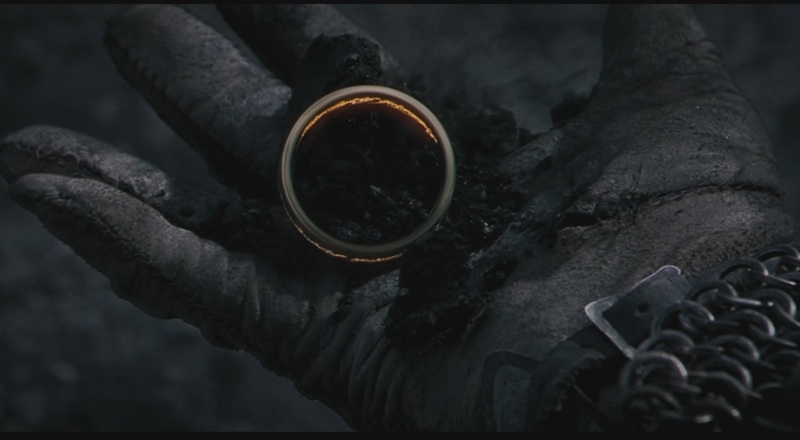 Does the One Ring change size with its bearer? Being that the ring is magical, does it conform to the ring bearer's hand size? In the very first battle scene Sauron get his fingers cut off, then Isildur picks up the ring and it lays in his palm. There is a distinct size difference in the ring, does it change size with its carrier? Being that it is magical I can see that this could happen. Yes. At the very least, it seemed to. It was hot when I first took it, hot as a glede, and my hand was scorched, so that I doubt if ever again I shall be free of the pain of it. Yet even as I write it is cooled, and it seemeth to shrink, though it loseth neither its beauty nor its shape. Already the writing upon it, which at first was as clear as red flame, fadeth and is now only barely to be read. EDIT: Per recommendation in comments, here's a clip of it actually happening in the movies. 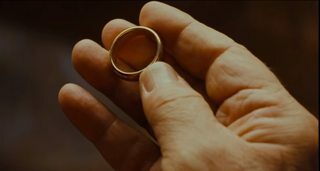 The ring isn't shown changing size in the opening, but in the later scene where Gandalf goes to Minas Tirith to research the ring in the library, and he finds an account by Isildur discussing it. Why did Sauron blow up if he only had his fingers cut off?